Congratulations to the DRC-Hubo@UNLV Team for their 8th Place Finish! The Howard R. Hughes College of Engineering is proud to announce that our team DRC-Hubo @UNLV finished in eighth place among the world’s best robotics teams competing in the 2015 U.S. Defense Advanced Research Projects Agency (DARPA) Challenge Finals, just a few points below universities such as Carnegie Melon and MIT. UNLV’s team performed six of eight tasks in 57 minutes and 41 seconds. Driving was arguably the most challenging task in the competition, but Paul Oh hoped that UNLV would emerge as a leader in that area. Metal Robot drove in less than 60 seconds, ranking among the top teams in the competition. Help our team explore the future in robotics! 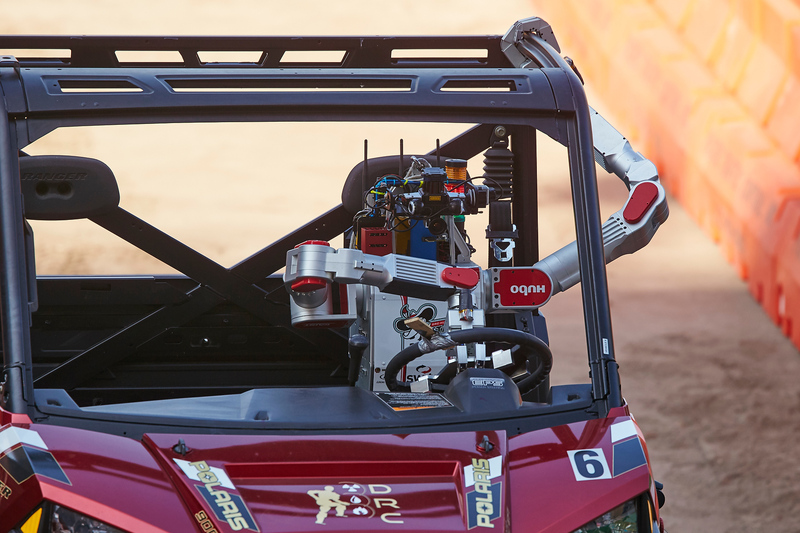 The world’s foremost roboticists, within the most advanced humanoid research and development organizations in the world, are competing in the most significant robotics trials ever to take place. 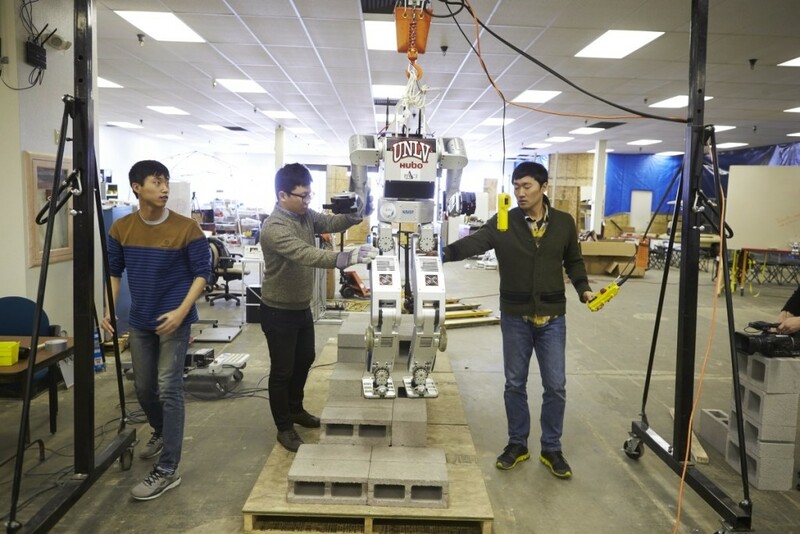 The DARPA Robotics Challenge aspires to further robotics development to aid disaster response and the University of Nevada, Las Vegas is proud to be a part of this prestigious robotics competition. Team DRC-Hubo@UNLV, led by Professor Paul Oh, Lincy Professor for Unmanned Aerial Systems at UNLV, will compete for $3.5 million in prizes and international prestige. We invite you to learn more and support Team DRC-Hubo@UNLV. 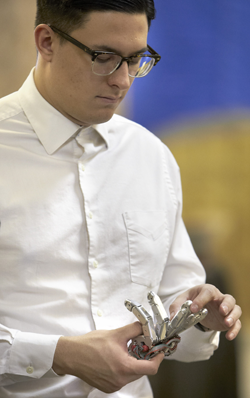 To date, organizations have struggled in the design and manufacture of robotic fingers. Robot fingers are difficult to make and manufacture because there are a lot of joint of degree of freedoms which requires many motors inside the hand to mimic human hand motion. Commercial off-the-shelf robotic hands are generally very weak; rendering them ineffective in grasping tasks, such as turning belts, removing debris, and operating hoses. A new finger design dramatically increases the grasping power of the fingers of DRC-Hubo. A very powerful motor inside of the hands with numerous reduction gears provides more force – up to 200 Newtons. In layman’s terms, the robot can grasp and move a 20 kg object. Praxis Aerospace Concepts International (PACI), a service-disabled veteran-owned business, is a key member of the DRC-HUBO@UNLV team. PACI provides subject matter experts to the DRC-HUBO@UNLV Team in distributed network systems, cloud computing, human factors/engineering psychology, technical management and operational test and evaluation. The team is looking for more wonderful supporters, like PACI, to help us reach our goals.